UK Residents Note: Items on this page are mostly only available in the USA. 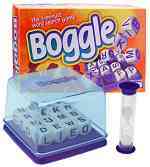 Click here to go to the UK Boggle Games page. The 3-minute word search game. 16 letter dice in a durable plastic case. Recommended age: 7 years and up. Compact version for playing anywhere. Play timed or untimed game versions. One (against computer) & two player modes. Small, lightweight, and comfy to hold. Sound effects and automatic scoring. Boggle word games in book form. Play Boggle on the move. Themed variations on classic Boggle. Two classic word games for Windows. Play Boggle against the clock. Multiple skill levels: beginner to expert. 5 extra word games and built-in dictionary. Play solo or multiple player mode. Junior version of the popular word game. Teach children how to play Boggle. Ideal learning tool for beggining readers. Includes tray, 8 letter dice and 90 word cards. Boggle, Jr. designed for children. Boggle games, rebuses, coded messages, crosswords, word finds, and more. Take-anywhere paperback: pass the time whilst traveling. 62 pages of fun and educational vocabulary games for kids. Many variations on classic Boggle. 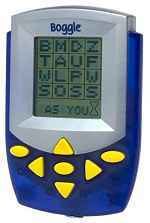 The popular word game for GameBoy. 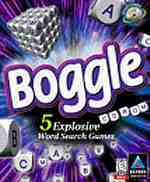 Five games in one including Classic Boggle, Big Boggle, Categories and Anagrams. For 1 or 2 players using link cable. Dictionary includes over 35,000 words. The classic word game for Windows PCs. 3-minute rounds for quick game play. Includes 5 exciting word game variations. Play solo or multiple player modes (1-4). Play against friends via Internet or LAN. Details of discounts are correct at time of listing. Please check at the Amazon web site to ensure any discounts mentioned are still valid.